2018 REMODELED: Just Completed December 2018! This Fantastic Townhouse offers a contemporary design and features 4 Bedrooms, (which includes a cozy Loft with two twin beds) and 3 Bathrooms. The townhouse backs to a secluded snowy hillside and has is own 8 person Hot Tub for relaxing after a full day of skiing! This Townhouse truly has the Perfect location at the Top of Main Street offering quick walking access to all the shops and restaurants on Main Street and access to the Townlift at the bottom of Main Street. It's also Located only a few steps from the FREE Main Street Trolley which can drop guests at any place on Main Street! The Mountain Trolley has been owner operated, with an emphasis on making guests feel right at home! This ideal Old Town location has two off street parking spots! , Some guests choose not to rent a vehicle because of the location and easy access to Main Street, transportation and skiing! The access to the slopes via the Free Main Street Trolley and the Free Park City Bus System makes staying at the Mountain Trolley Townhouse very convenient! The townhouse has been well appointed with comfortable contemporary furnishing! There are new wood floors, a new contemporary white stone fireplace, new kitchen with white quartz countertops and new Jennaire stainless appliances, high vaulted living room ceilings, two master suites with private bathrooms, one of which has a large jetted tub, the new master bedroom has a built in makeup vanity and a large master walk in closet! Our intent is to make our guests feel right at home! Hi! I am Julie Rawl and I’m thrilled to share my beautiful townhouse with you and your family and friends! I just completed an extensively remodel on the townhouse and it now has the appearance of a nearly new property! The townhouse is conveniently located at the Top of Historic Main Street! Call me with any questions or to make your reservation! Julie Rawl 435-640-0166 Check out the website at www.MountainTrolley.com to see the video and the 3D tour. 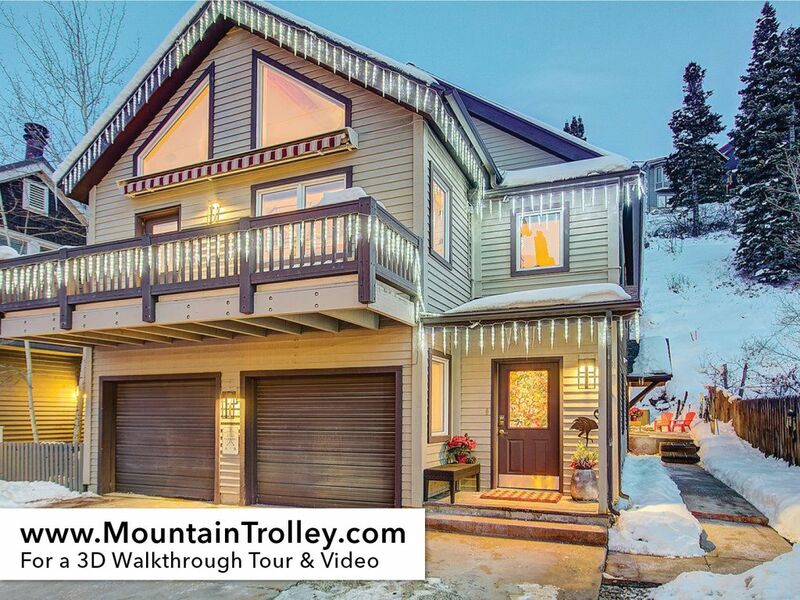 The Mountain Trolley Townhouse has been extensively remodeled in 2018 and has a beautiful contemporary decor and it is located at the Top of Historic Main Street, where you'll find the best shops and restaurants that Park City has to offer! . A quick stroll or ride on the Free Main Street Trolley, will have you at the bottom of Main Street where you can load onto the Townlift and Ski the largest ski area in North America! Vail now owns both Park City Mountain and the Canyons and has joined these world famous resorts by building a 50 million dollar gondola a few years ago! Skiing , shopping and walk to Main Street where all the restaurants and nightlife are and also jump on the Free Main Street Trolley and go to the Townlift to access The largest ski area in North America! Bedroom 4 shares a bathroom that is located on the Main Living Level. Mountain Trolley is located at the Top of Historic Main Street, which is Park City's Downtown! Close to Park City Mtn &Deer Valley! Vail purchased PCMR in Fall '14 & in the Summer of '15 linked PCMR&Canyons, via a 50 million dollar gondola, creating the largest ski area in North America! Mountain Trolley Townhouse backs to a mountain side with views of large pine trees and down canyon views from a few of the Windows. Stack Washer/Dryer in laundry room. Living room gas fireplace and another electric fireplace in one master suite..
Two open parking spots in front of the Townhouse! Two parking spots in the Driveway. Just Remodeled Summer 2018! Brand New Kitchen with all NEW Jennair appliances! Water Softner and Reverse Osmosis system for clean great tasting water! Plus Cusinart & an electric slow cooker. New large dining area can accommodate 12 people! Balcony overlooks a lovely wooded hill behind the town house, offering privacy for the townhouse. There is a new large stone patio! Less than 1/3 mile from the Townlift! Mountain Trolley is located next to the Trolley Turn around, where you can catch the FREE Main Street and be dropped anywhere on Main Street where all the shops and restaurants are, including the Townlift, where you can access the largest ski area in North America! This was a nice property everything is newly re modeled all new appliances. Very clean well designed interior. The manger Julie is very helpful as well. Great location with high quality remodel. Beautiful home. The owner Julie was so easy to work with. She called us after we were here a day to make sure we didn’t need anything and answer any questions on the house. We loved the house! Great place, location, all renovated! Really enjoyed our week at Julie’s place. 3 full bedrooms for our 3 couple family - including a private suite downstairs. Everything newly renovated and well stocked for those who like to cook at home. Wonderful location at the top of Main Street and Julie was very responsive. Perfect location, wonderful house. We’re a party of 9 and we all were comfy! We’ll stay there again! Excellent! Can't wait to stay here again. Everything about our experience with Julie and the Mountain Trolley House was great. Julie was an incredible host, was willing to talk to us at all times, very responsive, and had great local information for anything we wanted to do. The trip was an annual friends ski trip, and we stay lots of places out west, this was by far the best experience with an owner we have ever had. The house itself was also perfect. It is right at the top of Main St, 2-3 houses down from the Trolley which takes you right into town, and right to the Town Life so you don't have to walk win your gear. Its a 5-10 minute walk if you chose to walk in town. The location couldn't have been better. The property had everything, all the cooking utensils we needed, a hot tub to enjoy after skiing, the rooms were spacious and comfortable, the showers were great (main bath has a great tub and even epsom salt to soak with!!). Can't say enough about how great our experience was and how wonderful it was to work with Julie. Thank you! Thank you so much for your kind words! I’m so glad you had a wonderful ski trip! It was a pleasure having you all as my guests and I look forward to having you back again next year! The Mountain Trolley Townhouse, is located at the Top of Historic Main Street, where there are over 50 restaurants and bars, shopping; everything for your skiing and snowboarding needs (including gear rental shops), spa's; offering relaxing massages, Transportation: Free Main Street Trolley and the Transit center which offers free bus service! Please contract the owner with any questions. Mountain Trolley may accommodate 1 small Dog, per reservation. The Dog must be house trained and under 30 lbs. Traveler must check in with the owner about their pet, prior to making the reservation.